He has a son in Monsey. 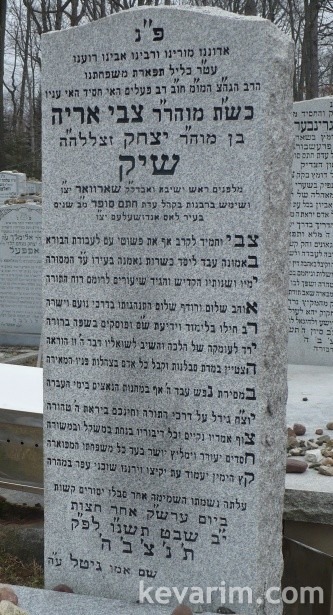 The late SA Weissmandl z”l (nephew of Reb Michoel Ber zt”l) was his son in law. R’ Tzvi Aryeh Schick was born 1913 in Sarvar, Hungary, to son of Yitzchok Schick and Gitl Kopstein. He was Talmid of R’ Akiva Sofer of Pressburg, and R’ Shmuel David Ungar of Nitra. R’ Tzvi Aryeh married twice. His first wife was daughter of the Mezokeresztes Rav R’ Asher Cseh. The second wife Dora Goldstein from Serdahel (Dunaszerdahely). He served as Rav in Sarvar abt. 1945-1947. Whos son was Yitzchok Schick, are they decsendants from the Mahara”m Schick? I do not know. Anyway, Yitzchok is common name in the family of Mahara’m Schick. Rav Yitzchak was his father, Rebbetzin Gitel was his mother, and his second wife was Rebbetzin Dora .